On a Saturday evening I spent some time in upgrading my MacBook Pro with an SSD. The only SSD I had was having security Onion built on it. So I fired up the best NSM OS and tested. – Heap spray attempt is a technique that assists in exploiting web applications by sending large strings. It facilitates Arbitrary code execution. To be clear Heap Spray attempt does not exploit a vulnerability, however, due to its manipulating attributes, it makes it easier to exploit a vulnerability. 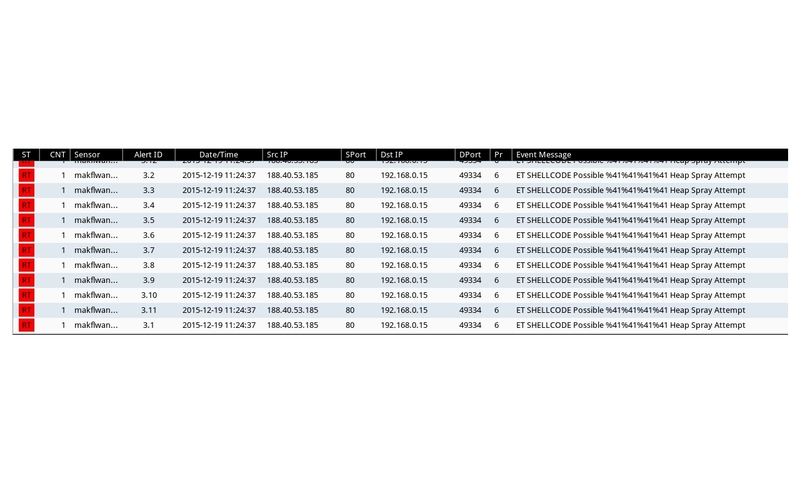 Attached Screenshot shows the payload. Following IP address is where the site is hosted. IP address have bad reputation and blacklisted. Did not find any further communications suggesting that website has other re-directions to any sort of malicious content yet. From this analysis I can say that there are sites where by the legacy techniques are still being used to compromise them – saying that it means that security in relation to generic websites is still lacking which puts any kind of users in risks. These endpoints needs to be secured but How ? How can we secure each an every site ? Answer is its not feasible, however we as a user can always increase our level of understanding security and its applicability.